Twilight zone. Admittedly, Halloween is already a few weeks behind us, but I was reminded of it a week ago when I stumbled across the concept of phantom heritability. And guess what, this concept has already been out there since early 2012 and, scarily enough, we didn’t notice it. So what is this mysterious conspiracy behind phantom heritability? Well, it’s about things out there beyond our understanding and the fact that we might already know more than we think we know. But be warned, if you decide to read this post, your understanding of genetic architecture might be changed forever. And there is no going back. Boo! Still alive? I was exaggerating, of course. But discussing phantom heritability is a good opportunity to talk about two things that I enjoy: heritability (the nerdy side of me) and other genetics blogs (something that I have promised Roland for quite some time, but never got around to). In fact, phantom heritability has been discussed extensively on other blogs, most prominently on Genetic Inference and Genomes Unzipped. Therefore, I’ll try to distill the current state of the discussion for the epilepsy field. Don’t worry, this won’t be a boring post on statistics. It’s about ghosts and phantoms, remember? The missing heritability. Ever since the paper by Manolio, the concept of missing heritability has been frequently used. Missing heritability basically refers to the observation that family studies suggest a much higher heritability than is explained by existing gene findings. In most cases, this referred to the explanatory power of variants identified through genome-wide association studies (GWAS). Even in diseases where GWAS was highly successful, the existing variants only explain little of the overall genetic burden found through twin studies or family aggregation studies. So why is that? The politics of missing heritability. It is important to be careful distinguishing the actual problem of missing heritability from suggestions of how to find it. In most cases, the missing heritability problem is cited to support research into the role of rare genetic variants or non-coding variants. Therefore, missing heritability is often exploited rather than critically addressed. In fact, the most basic questions would be: (a) is it really missing and (b) should we care? Is heritability missing? The short answer is yes. However, we usually look at heritability using a so-called additive model. An additive model suggests that the effect of genetic variants simply adds up. However, there might be an interaction between genetic factors. Imagine two genetic variants that only increase the risk by a factor of 1.1, but taken together, they increase the risk by a factor of 50 or more. This non-additive increase in risk is called epistasis, also known as gene-gene interaction. And epistasis might underlie the mysterious phenomenon of phantom heritability. Furthermore, epistasis is virtually impossible to identify. Epistasis. If you think that 1,000 cases are already a lot when considering an association study, think again when you consider epistasis. In order to assess interaction between genetic variants, you would need hundreds of thousands of samples. However, epistasis might make sense biologically, as risk genes for particular disorders might code for proteins within a particular network. Just imagine interaction between different ion channel variantsthat all add only little to the changes in the membrane potential, but collectively produce an unpredictable, epistatic effect. This scenario will be impossible to solve on the genetic level. But does epistasis really exist, and what does it have to do with phantom heritability? Chasing the phantom. The idea that epistasis complicates the genetic investigation of complex traits is not new. And given that much of this possible interaction is beyond the reach of modern genetic studies due to the massive sample sizes that would be required, much of the discussion is hypothetical. 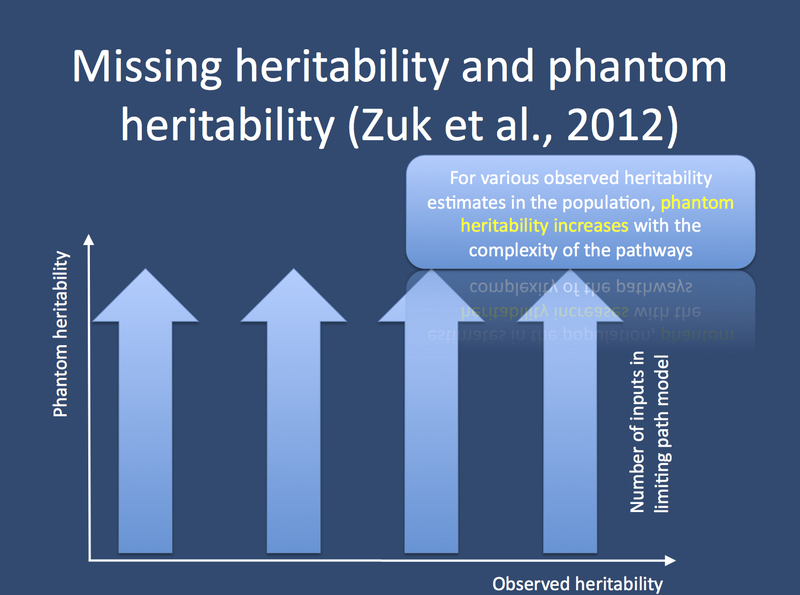 What the paper on phantom heritability by Zuk and colleagues adds are basically two things. First of all, they develop an alternative to a purely additive model, which they refer to as a limiting pathway (LP) model. Secondly, they demonstrate that this model might generate phantom heritability. Let me explain: Basically, under such a limited pathway model, a trait or a disease is caused by the rate-limiting steps of several inputs. The designation rate-limiting reminiscent of the dynamics of biochemical pathways already reminds us that the authors had complex biological pathways in mind when they suggested this network. And when this trait has multiple inputs, genetic interactions necessarily occur. Then they use this model to generate various scenarios comparing the heritability that would be observed. In brief, they compare the heritability seen twins or siblings and the heritability explained through the individual genetic variants. As they have defined all the variants and their interactions in their simulation, they know the “broad-sense” heritability upfront and can measure how much of this pre-defined heritability can be explained when the individual genetic variants are analyzed. For example, they can create a model with a broad-sense heritability of 80% (as seen in IGE) and simulate a trait with 10 different rate-limiting inputs. It turns out that the heritability seen in twins (broad-sense) is almost always much higher than the heritability explained through the single variants. And this difference is the phantom heritability. In summary, interactions between genes may generate scenarios where the broad-sense heritability is very high and the heritability explained through single genetic variants is very low. There are no other mechanisms involved and there is no need to chase missing heritability. Should we care about missing heritability? The authors make the important point that missing heritability might be something that we don’t have to worry about. Given that epistasis is realistic and impossible to identify, we might always be dealing with phantom heritability. Two years ago, there was quite some hype regarding the possible impact of rare variants due to the missing heritability through GWAS studies. This enthusiasm has since died down as scientists increasingly realize the difficulties in handling rare genomic variation. Regulatory elements will probably be next with similar disappointments along the way. The discussion of phantom heritability tries to explore alternative scenarios for the genetic architecture of human disease. This will hopefully put the cycle of alternating enthusiasm and disappointment regarding novel genetic technologies into context. This entry was posted in 2012, EuroEPINOMICS, Ideas, Papers and tagged genome-wide association study, GWAS, missing heritability, phantom heritability, rare variants, science, twin study, whole exome sequencing. Bookmark the permalink.